There are 25 posts in this thread, and it has been viewed 22363 times. Sengoku 2 is the best, amirite? 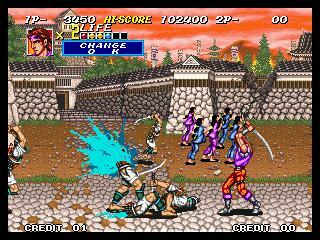 I daresay this game beats its predacessor but I don't think it could ever catch up to its next generation "Sengoku 3". 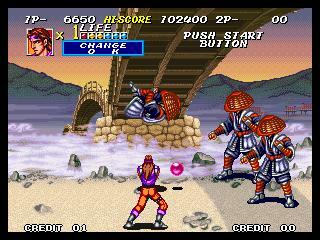 Still I prefer the Sengoku 1 transformations and transportation mode as opposed to the Sengoku 2 sorts. The horse riding in certain stages is far too easy for players. The slash and thrust techniques make the game more interesting than just a simple attack move. The music is definitely better than the tracks in the first game. I wish the years would be specified instead those 19XX etc., that's so common in video games, I long to know the exact decade and year and not just the century. This game has certainly earned its long gap attention from the first game. I don't like scrolling fighters generally, but this looks okay I guess, never played it. Is it expensive on AES? 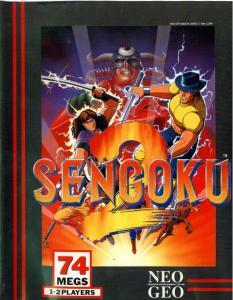 I'm a big fan of Sengoku 2. The game gets better and better, more fun and more interesting the further through it you progress. I think most dismissers probably do so without giving it the time it deserves. Graphically, it's overshadowed by Sengoku 3 but this game, imo, is far more interesting and holds my attention far longer. i have it for the AES, but haven't played it a lot.... definitely an improvement over the first one. I'll have to give it another shot then as I am not too keen on the third game. It's nice, but way too many of the same enemies over, and over. Doubt I'd ever buy it though at the price it goes for. I have this on NGCD and it was a bugger to track down, I also believe this is the case with the MVS/AES versions as I have only seen the MVS copy once on ebay and it was �120. The game itself is a game of its time a little dated but fun all the same. I have only played the 1st game on emu but 2 seems to be the better game, I kinda like the weird feel to the game and the colourful graphics its like it nothing really fits together and the enemy's and bosses are very bizarre but that's its charm so I voted its ok, playing this in the early 90s I would have said great. I haven't played this yet and don't plan on getting it. Not because its that bad per se, but Final Fight is still the ultimate 2d beat em up imho. It's also the only reason I still keep a sega cd hooked up. It is pricey, huh, I bought the NGCD version for about �10 I think back in the day... Worth every penny and then some. Well worth a blast emulated, imo it's probably the best scroller the Neo has to offer. Admittedly that isn't saying a great deal when compared to Capcom's best but hey, Neo scrollers can be damn good fun all the same. I'm so incredibley bored of Final Fight... Imo Streets of Rage 2 on the MD is better in almost every way. Cadillacs and Dinosaurs is, for my money, the best scroller there is. Better looking, better sounding, more fun and infinitely more interesting than Final Fight. Saying that I'd take most of Capcom's scrollers over FF. I loved FF back in the day but it really is the poor cousin when compared to other Capcom efforts like Punisher, AvP et al. 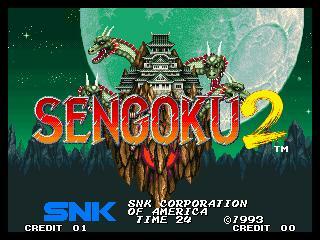 I love Sengoku 2. I've never been all that keen on the first game in the series which I think hasn't aged very well at all. The second installment is so much better in every way with graphics and gameplay much improved. One thing I really like about the game is that there's a lot of variety between stages including the sections where you are drawn into the spirit realm and the brief but fun horse riding sections. The intro and start of the game are pretty memorable when the princess speaks to you and then the dragon appears with some very dramatic music. Like I've said before SNK although they made some fun side scrollers where never really in the same league as Capcom, IGS and Konami with this genre. I'd say probably Tower of Doom, Shadow Over Mystara, Denjin Makai 2 and the Knights of Valour series are the best side scrollers I've played. To be honest I've only played part 3 of this series. I enjoyed it a fair amount. Maybe I'll give the other 2 a shot when I've got the time. Also, like Merlin said, D&D SOMystaria is damn good (I have it on SAT) and so is Tenchi Wo Kurau 2 (it does have a non-wanker sounding UK/US localisation). Ah... Final Fight 3 on SNES is also very good too... and deeper than FF1! @Shiny: Yea, I know FF has been played out, but it still keeps me coming back. Might be because of nostalgia but I also feel its the right length for a beat-em up. I agree that SOR2 is great and definitely a contender, but FF is still my fav. @Ninja: I gave up FF on the SNES after the crap that was FF2. But you got my attention. FF3 is on my get list now. CapCommando rocks! Raiken, Arrow Flash? For shame. Shame Capcom didn't consider FF2 & FF3 for arcade release, I don't think limiting the sequels to a home console (back then) was such a good idea. Hmmm CPS2 for FF2 & CPS3 for FF3 I know I'm dreaming. but it's a nice thought... a CPS3 quality beat em up by Capcom... Wow! Very good. A big improvement over the ugly-as-sin, stupidly difficult first game. Yeah I really got into it recently. 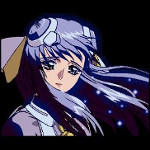 It's not my fave Genesis/Megadrive shmup though. 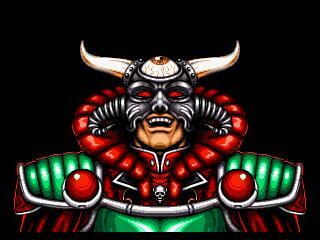 That will always be MUSHA Aleste.